There is a very Precious Sangu (Shell) for the Perumal. 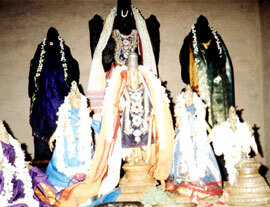 The idol of Sri Andal which is small, is very beautiful. The temple is located near Sirgazhi. The place is known popularly as Thalaisangaadu. Thaayaar - Thalaisanga Naachiyaar. Utsavar - Sengamalavalli Thaayaar. Access to the temple About 15 Kms from Mayavaram on the Mayavaram-KaveriPoompatinam(the world famous " Poompuhar " ). The Moolavar is Naanmadhiya Perumal. This temple lies in the Tanjore district of Tamil Nadu. First, we have to travel to Aakur from Mayavaram, and then it's about 2 kms away in the route towards Seerkazhi. It's 7 Km away from Kaviripoompatinam. Has no proper arrangements for stay.